A couple of years ago, Bojan Bernard Bostjancic, an avid bicyclist and mobile entrepreneur, plunked down more than $200 for a heart-rate monitor to help measure his exercise workouts. But with the rise of smartphones, he wondered why he couldn’t just use his iPhone to take care of the task. So along with Peter Kuhar, he built Instant Heart Rate, an iPhone app that measures a user’s heart rate through a smartphone camera. 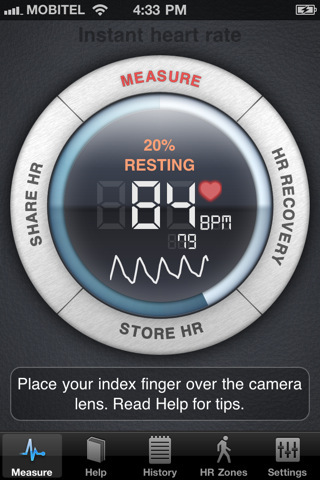 Users just hold their finger over the camera for ten seconds, and the app is able to detect and measure their heart rate. The app, which debuted on the iPhone (s aapl) last fall and later made its way to Android,(s goog) has now racked up 8 million downloads in nine months and has helped raise awareness around the potential of smartphones as biofeedback devices. Bostjancic and Kuhar’s Palo Alto, Calif., startup Azumio is part of a growing boom in mobile health, and it’s attracting a fair amount of investor attention. The company announced on Wednesday that it has raised $2.5 million from Founders Fund, Accel Partners and Felicis Ventures. Azumio will use the money to expand its product line, which now includes two new stress- and treatment-monitoring apps called Stress Check and Stress Doctor. Bostjancic said he’s surprised by the popularity of Instant Heart Rate, which had no marketing dollars behind it. But he said it taps into the power of the smartphone and the growing realization that these devices can play an important role in helping measure and improve people’s health. Bostjancic said smartphone feedback and health apps won’t replace dedicated devices. But he said they’re bringing health applications to a much wider audience, thanks to distribution channels like Apple’s App Store and the Android Market. He said the Instant Heart Rate app appeals to many, from patients monitoring their heart to athletes who want immediate feedback on their workouts. This is Bostjancic’s latest venture, after selling WiMAX hardware maker Telsima to Harris Stratex for $12 million in 2009. Bostjancic, who got his postdoc at CERN in Geneva, sold his first Internet startup to Siemens (s si) and later founded mobile-streaming-video service LiveCLIQ. His partner, Kuhar, developed medical devices at Modula and NFC mobile payment for Halcom. The investment in Azumio shows that mobile health is going to be a growing opportunity. This is a promising field, not just for the money to be made. It shows that there are real-world benefits that can happen when we use smartphones as health sensors. We’re seeing that with RunKeeper and its expanding ambitions to be a health platform. And others are tapping the potential of smartphones to improve people’s health. With improvements to the Bluetooth standard, which recently added support for health-thermometer and heart-rate profiles, we can expect to see more low-power gadgets that can work in conjunction with smartphones to provide biofeedback and health monitoring. There’s a lot of opportunity here, and I think we’re just starting to see the potential for smartphones to improve health outcomes. I personally think this is a great development and shows that smartphones are powerful tools that not only connect, inform and entertain but can also help tackle real-world problems and improve people’s lives.